Dr Muhammad Aslam, Rector UMT, hosted coffee on January 8, 2018 for SLP fulltime faculty and some outstanding students in order to appreciate the successful co-organization of an international conference, titled ‘Islamic Finance: Between Religious Norms and Legal Practice,’ by SLP at KU Leuven, Belgium, on December 7, 2017. No other Pakistani law school holds the distinction of co-organizing an international conference in Europe; let alone, at one of its ancient and prestigious universities. Dr Aslam shared his experiences of Germany while he was a student and he narrated different instances of his academic and cultural experiences in Europe. He stressed that Pakistani academics should strive to provide such valuable opportunities to their students. 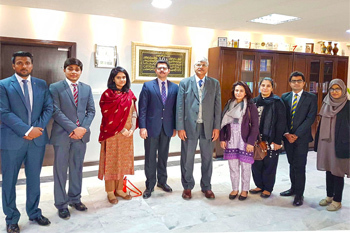 He acknowledged and praised Imad-ud-Din Asad’s relentless efforts that have culminated into strong and mutually beneficial relations with some of the top law faculties in Europe and that have established SLP as the most international law school in Pakistan. Dr Aslam assured Imad-ud-Din Asad and SLP of his full support for such initiatives in future as well.